Congratulations to the St. Peter Chanel yearbook staff and Mrs. Jenny Miroglotta for achieving the National Yearbook Program of Excellence designation for the 2011-2012 school year! St. Peter Chanel was one of only 5 schools who received the award in the entire state! In recognition of their excellent work, the yearbook staff received a personalized plaque and a large banner signifying this honor. The banner will be displayed in the main hallway next to our publicity bulletin board. Congratulations on a job well done! Invictus is Chanel’s yearbook. 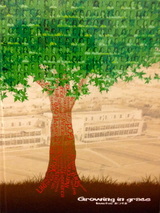 Distributed in early fall to all students, our yearbook is hardback and in full color. Since Chanel charges no fees beyond tuition, the yearbook is included in a student’s tuition. Invictus is produced by Josten’s, which utilizes an online website for the creation of the entire book, making our staff’s work both professional and enjoyable. Seniors are encouraged to have their picture taken by the photographer of their choice, as long as we receive a wallet-sized glossy by February 15. Senior pictures must be head shots. No hats are allowed, and no facial hair or earrings are allowed on the men. Dress must be tasteful and appropriate. Any questions? Contact Jenny Miroglotta, yearbook moderator. Send a brief message to your child, and his/her baby picture in the 2013 Invictus. Columbia Scholastic Press Association has awarded the 2009 Invictus and the 2010 Invictus with Silver Medalist Certificates. The theme of the 2009 book was Moving to a New Beat, and the cover and endsheets featured original artwork by Lamar McKnight, Class of 2009. 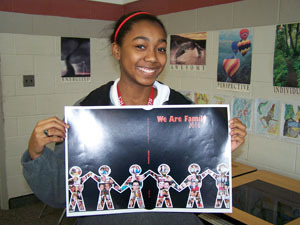 The theme of the 2010 book was We Are Family. • Scored higher in cumulative freshman college grade average. • Scored higher in their first collegiate English course. • Had higher ACT composite scores. • Had higher ACT English scores. Meetings will take place in room 207/ Publications Room or in Computer Lab 225 at 3:00. Editors are asked to come to work sessions as often as possible to receive instruction, work on pages, and help other students. The first three meetings of the year are mandatory for editors as are appearances at editor meetings and work sessions throughout the year. Staff members are required to attend work sessions at least once a month or to check in with Mrs. Miroglotta regarding their progress. Members who do not attend and do not make deadlines will be replaced. Work on yearbook pages can be done from home also but does not replace your required in-school work sessions. Additional work sessions may be added as needed.